Summer, while a very exciting time of the year, comes to an end after a couple of months. During this time we are faced with the task of preparing for the colder months ahead. Warmth in our homes becomes a priority rather than an afterthought. This is the best time to consider getting an electric fireplace. Not only do they provide that much-needed warmth in the home, designer fireplaces also provide a source of conversation and a reason to gather. But is an electric fireplace a good investment? Is it worth the trouble to get one? Let’s explore the myths surrounding this mysterious modern fixture that should be a part of everyone’s home. Myth 1: An electric fireplace is expensive to operate. Nothing is more wrong than this myth. In fact, this may be the single issue that is keeping you from buying one. If you can spare a few pennies a day, then there is no reason to get an electric fireplace. In fact, based on current electrical consumption prices, operating a 1500 watt electric fireplace only costs the average consumer a few pennies per hour. This is possible because electric fireplaces are more efficient than gas or any traditional log-burning setup. It is also more environmentally friendly and not as health damaging. Myth 2: Electric fireplaces cannot produce the beautiful flames of a traditional fireplace. If you are one of the many who still remembers what the first-generation electric fireplace looked like, then the hesitation is understandable. But modern technology has grown by leaps and bounds since its introduction, and the newer models of designer fireplaces produce flames that are as realistic as the real thing. Flames produced by an electric fireplace can look incredibly authentic. In fact, some companies offer their own versions that can easily be mistaken for a real wood-burning flame. Myth 3: Electric fireplaces can’t produce enough heat. Again, electric fireplaces are 100% efficient. This means that not only are they cheap to operate, but also they are efficient at heating up your space. Silent fans force the heat produced by the electric fireplace around your room for that even and comfortable heat we all crave on cold winter nights. All the heat produced by the fireplace is converted to warmth in the home instead of escaping out of a vent or a chimney. Myth 4: An electric fireplace cannot be repaired. 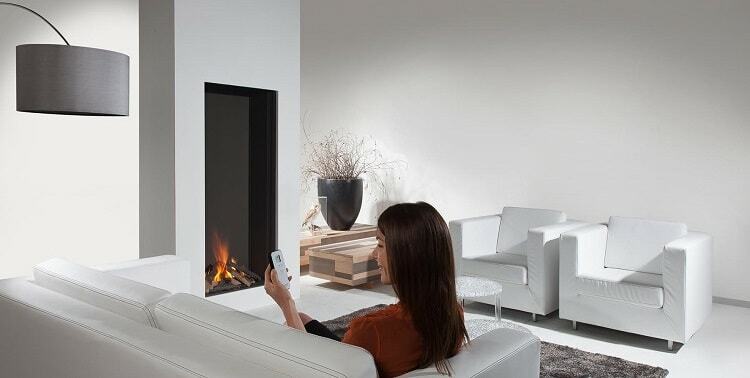 An electric fireplace is an ultrareliable piece of equipment. With so little moving parts that can wear down or break, you are all but assured of a trouble-free operation for a long time. However, like all good things, it is possible that your electric fireplace breaks down and its perfect record comes to an end. But worry not for help is just around the corner. Even if your fireplace breaks down, something as simple as calling the manufacturer can solve the problem. Consult your owners’ manual for simple troubleshooting. And if nothing works, call a technician to have it fixed. In short, if it breaks, it can be fixed. Cost-savings, efficient heat output, almost realistic and safe flames—these are some of the reasons why you need electric designer fireplaces are the best choice to keep your home warm and your family happy. Modus Fireplaces has been in the industry of producing bespoke fireplaces and providing luxury designer fireplaces for homes and hotels in the UK. Together with Europe’s top manufacturers, we are able to provide clients with great and unsurpassed collection of unique fireplaces.